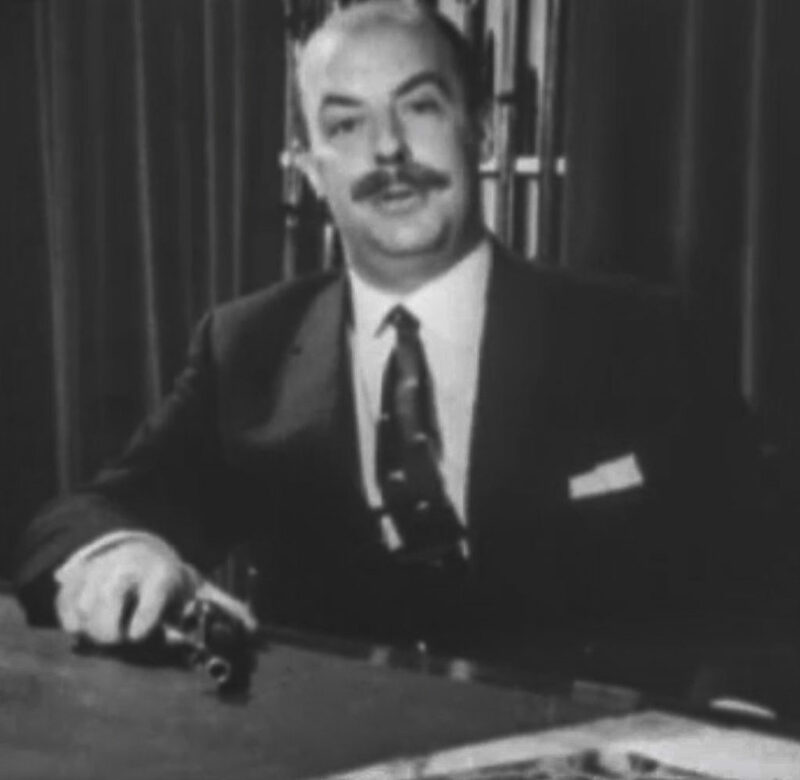 Did you know that Q, James Bond’s favourite quartermaster, was actually a former Strathbungo resident? The story comes courtesy of the Herald, and the sharp eyes of local resident David Cook. Imagine the curtains twitching back in 1956 when the CID called at 17 Regent Park Square. They wanted to question the licence-holder of a revolver matching the gun used by one of Scotland’s most notorious serial killers. Geoffrey Boothroyd, a young technical rep at ICI, told them that his gun was actually down south being illustrated for the cover of Ian Fleming’s next James Bond novel, From Russia with Love. 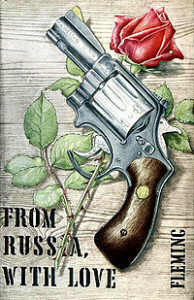 Cover of first edition, From Russia with Love. And it was true. Boothroyd, a gun collector, had written to Fleming earlier that year to say that Bond’s .25 Beretta was “really a lady’s gun”. He suggested instead a manly Smith & Wesson .38. Little did he know that it was also the weapon of choice for one Peter Manuel, then on a murderous spree that would claim seven lives, the last three in Burnside. The detectives eventually got their man and Manuel got justice at the end of a rope. Boothroyd and Fleming continued their friendly correspondence. At the end of From Russia with Love, Rosa Klebb managed to stab Bond with her famous boot, partly because his Beretta got caught in his holster. In his next novel, Dr No, Fleming included a whole chapter in which Bond was introduced by M to the armourer, Major Boothroyd. He confiscated Bond’s Beretta – “Ladies’ gun, sir” – for a Walther PPK, with the Smith & Wesson Centennial Airweight .38 revolver as back up. A new holster was also recommended, and all was based closely on Geoffrey Boothroyd’s advice. Daniel Craig still uses the Walther PPK to this day. Oddly the character Q never appeared in Fleming’s novels; he only referred to Q Branch, suppliers of gadgets. Major Boothroyd appeared just the once, and it wasn’t clear he was from Q Branch either. Boothroyd himself became firearms consultant for Dr No, the first Bond movie, and also advised on such matters as how to set an ocean on fire – no doubt his work at ICI came in handy. Peter Dawson played Major Boothroyd in the movie version of the above scene from Dr No. It was only in the second movie, From Russia with Love, that Major Boothroyd also became known as Q, and was played famously by Desmond Llewellyn, in that movie and for the subsequent 36 years. Geoffrey Boothroyd was quite an eccentric who once told Fleming: “I cherish a dream that one day a large tiger or lion will escape from the zoo or a travelling circus and I can bag it in Argyll Street.” That never happened, but he went on to become one of the world’s leading authorities on shotguns and handguns. Mr Boothroyd himself, in a 1964 short presented by Sean Connery, explains his reasoning behind his choice of weapons. The film appears to have been shot inside his Strathbungo home; although by this time he had moved from 17 to 11 Regent Park Square, where he lived from 1956 to 1971. A recent resident of No 11 recalls his parents purchasing the house from the Boothroyds, and remembers the house being full of weapons, including a Gatling gun in the living room. Does the current resident recognise it? I am slowly amassing a history of Strathbungo, including stories of former residents of note such as this. If you have any stories to tell, please get in touch. 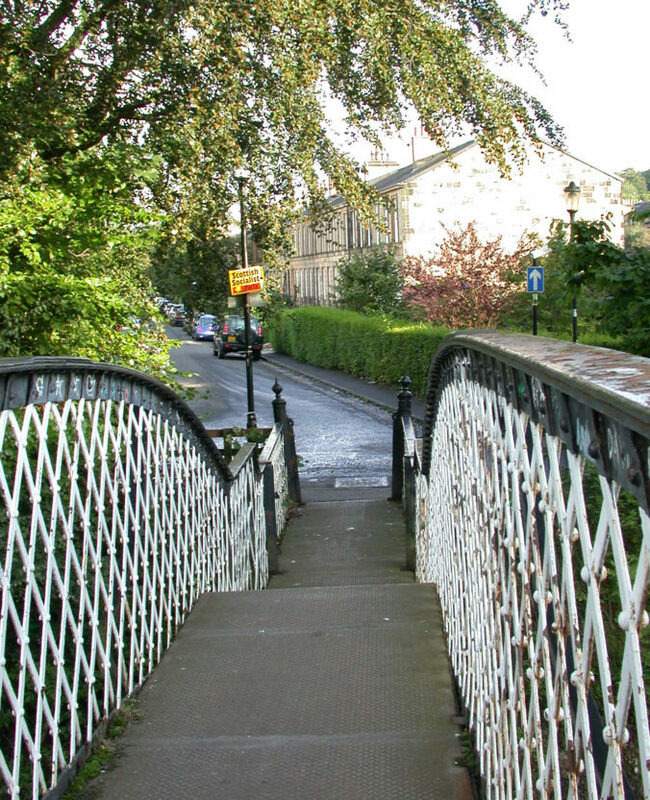 The Glasgow, Barrhead and Neilston Direct Railway line opened in 1848, well before any of the houses were built alongside. 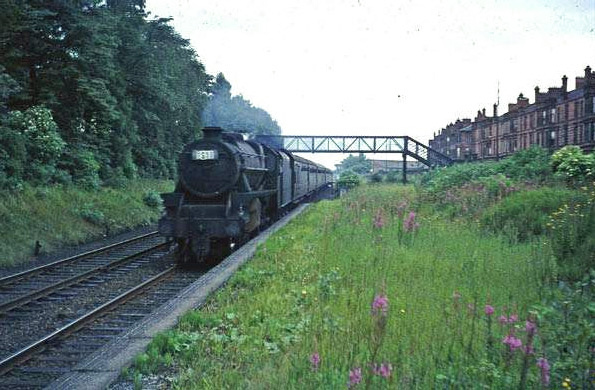 It ran from a terminus on the southside of Glasgow to Barrhead with the first stop at Pollokshaws West. 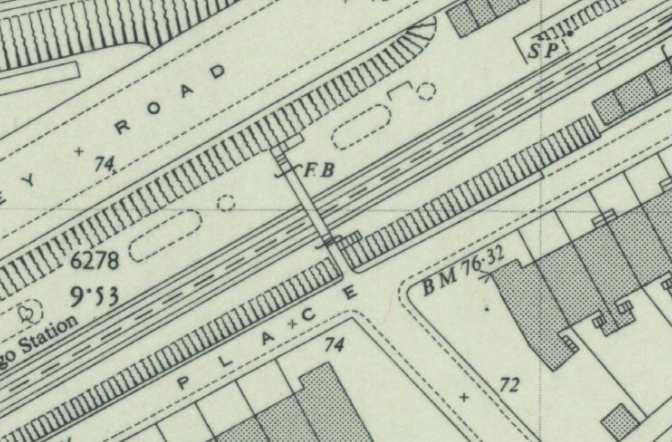 Strathbungo station was a later addition to the line, opening on 1 December 1877, and Crossmyloof followed even later, in 1888. 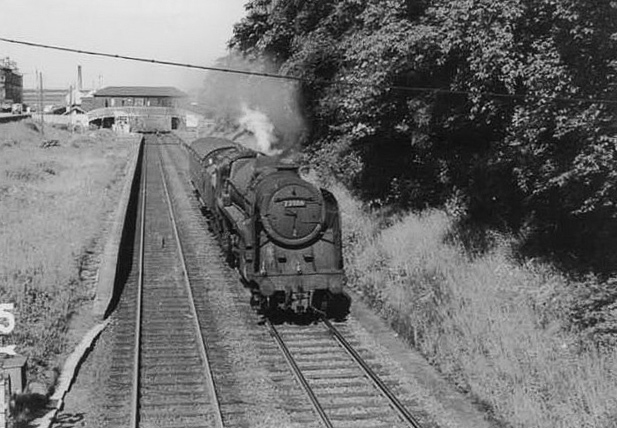 Strathbungo closed to passengers permanently on 28 May 1962. Today little trace remains of the station at rail level, though the former booking office building on the bridge above still stands, now Susie’s Store. Both the Glasgow Guide and Hidden Glasgow discussion boards describe a statue of a horse’s head, possibly of iron, now disappeared, with unanswered appeals for further information. 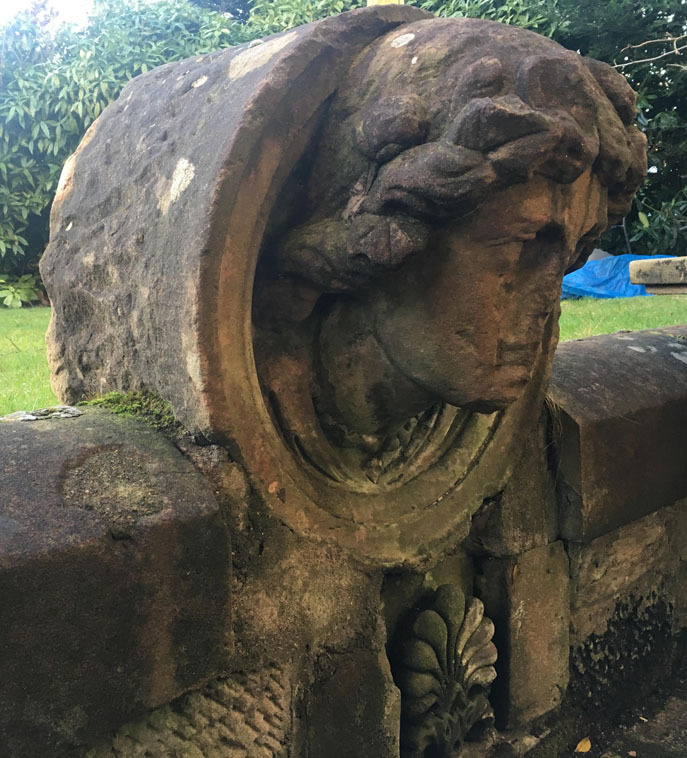 Meanwhile John Devitt recalled rescuing statues or busts from the embankment during a clean up and placing them in one of the Moray Place gardens, but wasn’t sure of their fate. In July 2018 I was passed some old Strathbungo Society documents, and the minutes describe how the stone heads were removed from the embankment on 24th August 1986 with the assistance of ScotRail (lest they be damaged during the forthcoming electrification of the line, hmm). 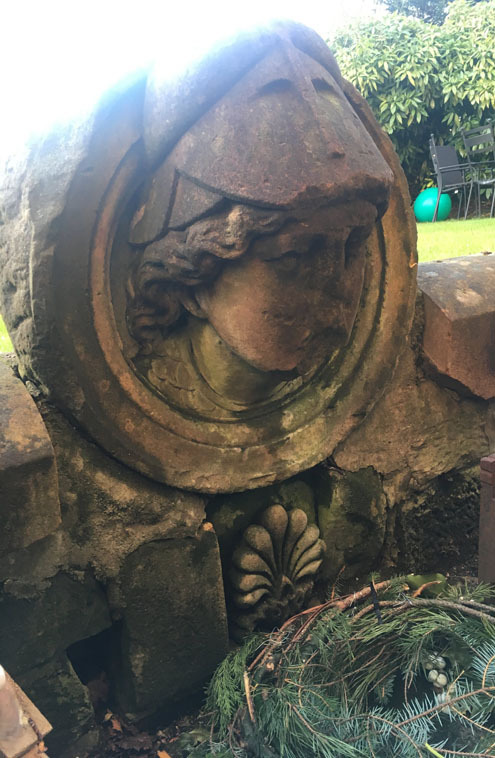 The Society Treasurer, Mrs A Allan, reported that the heads had belonged to the Strathbungo stationmaster, who had brought them with him from his previous station in Ayr. The Coat of Arms of Ayr Harbour Station was said to include Minerva, Hercules and Neptune. The heads were moved to the garden of Robin Haddow, a founding member of the society, on Moray Place. After a tip off, I discovered they are still there today, set into a garden wall, their provenance forgotten. One looks like Minerva, but I’m not sure of the second. I didn’t find a third. Or an iron horse. 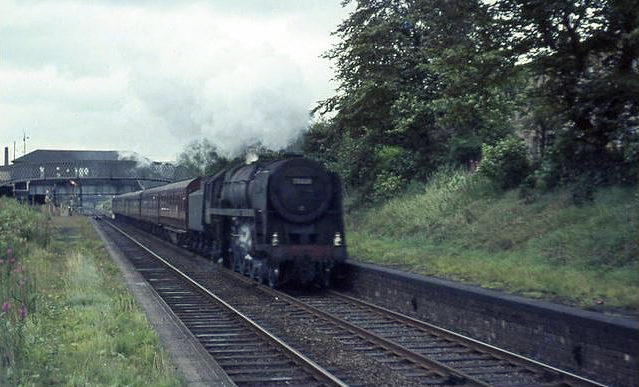 I had been on the last train to stop at Strathbungo in May 1962 and thought that that was that; but in November 1966 another medical student and I were on the train from Clarkston to sit an exam at Gilmorehill. As we were passing Strathbungo the diesel railcar dropped its gearbox, ran over it and derailed very noisily. Not wishing to miss the exam and realising that the train was going nowhere we got off, jumped the wall and went across to Pollokshields West for a Circle train. As it came in we saw that a large group of the less agile passengers had got off and walked along the line towards Muirhouse and then south through the short tunnel to the station causing great consternation to the driver. We managed to sit the exam and all was well. After closure, the steps down to the platforms from the booking hall and the footbridge were removed, and the booking hall became a shop, Susie’s, the name it still retains to this day. 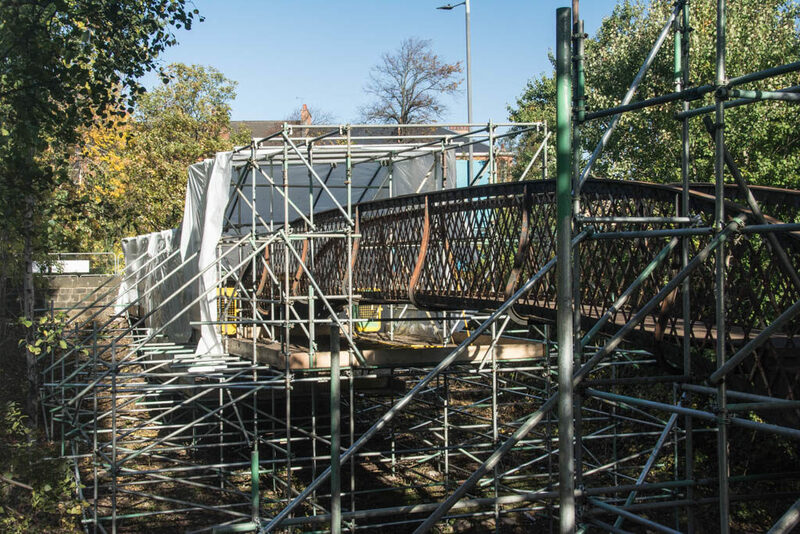 It is likely the metalwork from the steps down to the platform were then used to extend the footbridge to Darnley Road for the first time. There is more on the footbridge elsewhere. 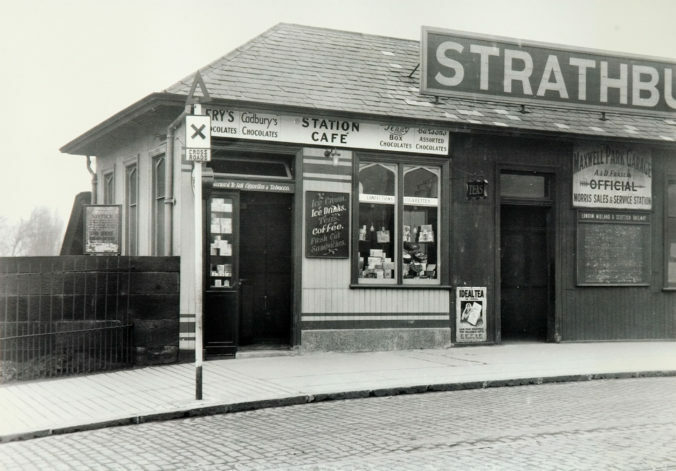 Old Strathbungo Station booking hall had become Susie’s by 1968. 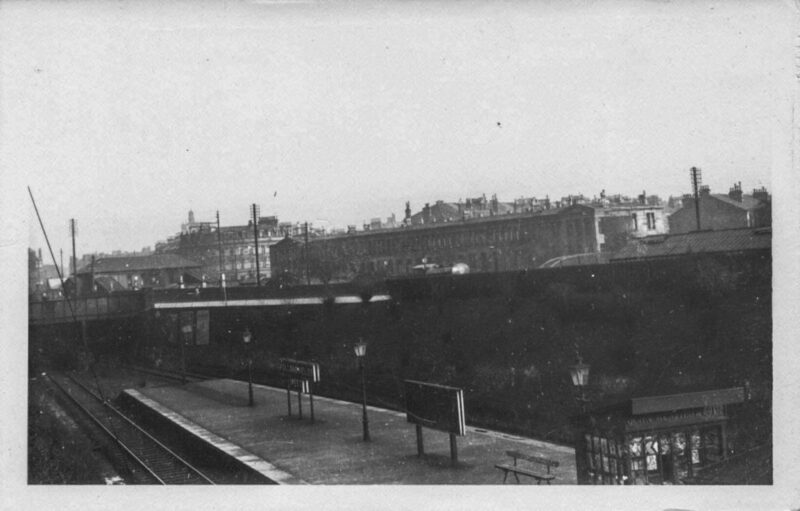 This scene taken from Pollokshields West Station across Darnley Road includes Strathbungo Station, the footbridge, 1-10 Moray Place and Salisbury Crescent. Article updated 13 Jan 2019. What a different affair was a primrose or a pansy to our Crossmyloof friends! It was indeed “a great deal more” than it seemed to the uninitiated. There are some sharpsighted people who are said to see farther into a millstone than their neighbours. For the truth of the saying we shall not venture to vouch; but most assuredly, for seeing into the mysteries of a tulip or a dahlia, we shall back a Crossmyloof or Strabungo weaver against the united amateurs of Scotland. This tradition may have been related to the local nursery, Austin & McAslan, although it is hard to determine which came first. The nursery business was started by John McAslan in 1717,, when he rented ground behind the old Hutcheson Hospital on Trongate, and latterly built a mansion and new nursery at The Hill, south of Dobbies Loan. 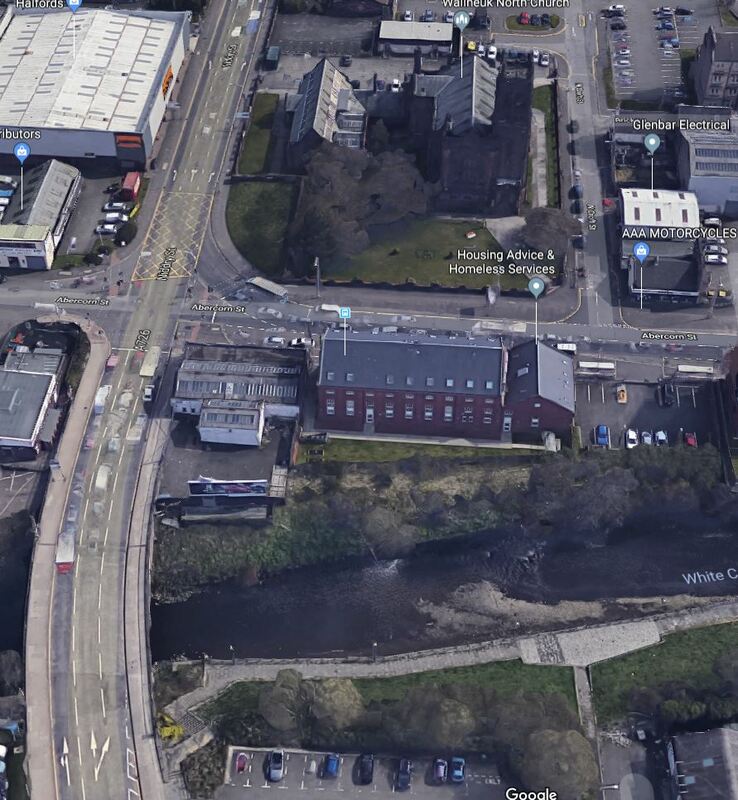 A street through this area was later named McAslan Street, although it has now disappeared under modern Townhead. He was joined by his brother Duncan, and succeeded by his wife, and then Duncan’s son, another John. 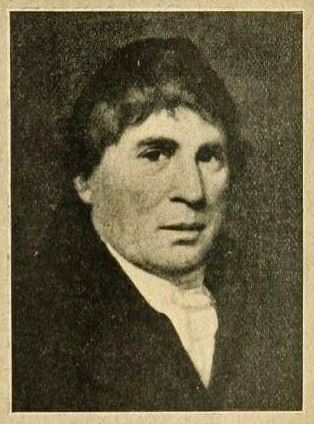 The foreman Robert Austin, of Milngavie, who trained in London, became a partner in 1782, and married into the family in 1786. 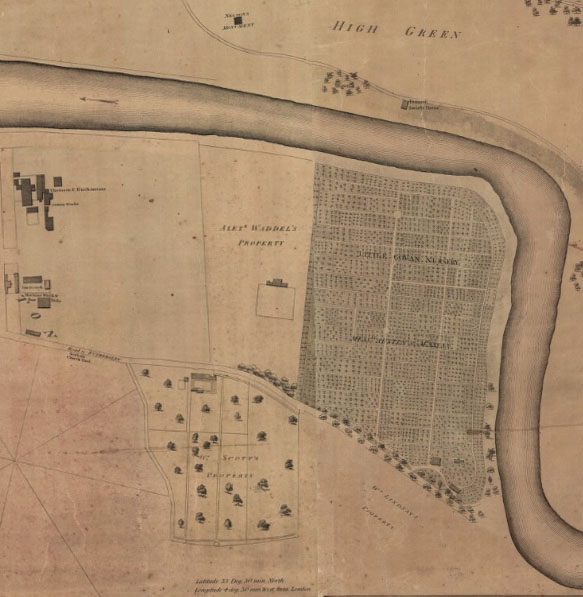 The nursery moved to Little Govan in 1798. In 1803 John McAslan retired, and his son Alexander partnered with Robert Austin, the name changing to Austin & McAslan. 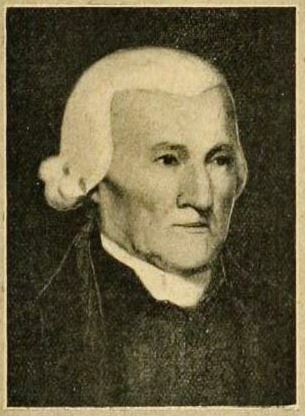 Robert’s younger brother James trained at Kew, before joining the firm. In 1828 the nursery moved again, to Coplawhill, immediately to the north of Strathbungo village. 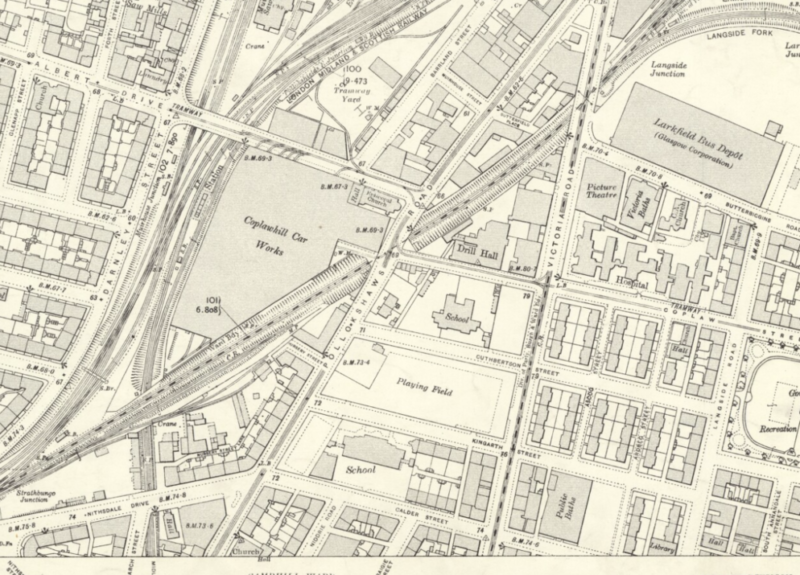 OS maps from the 1850s show a large nursery extending almost from Nithsdale Road (opposite the old Strathbungo Parish Church) to Albert Drive, and on the other side of Pollokshaws Road, to Butterbiggins and Langside Roads. The firm grew forest-trees, fruit-trees, shrubs, greenhouse plants and roses from Coplawhill. 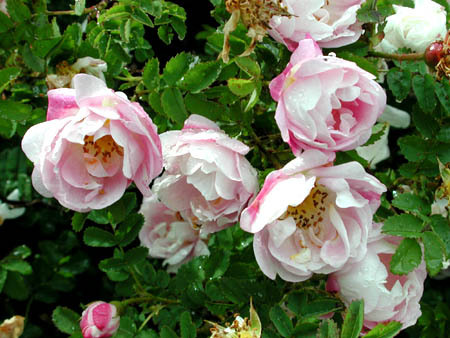 Robert Austin was noted for his promotion of the double scotch roses, then very popular. 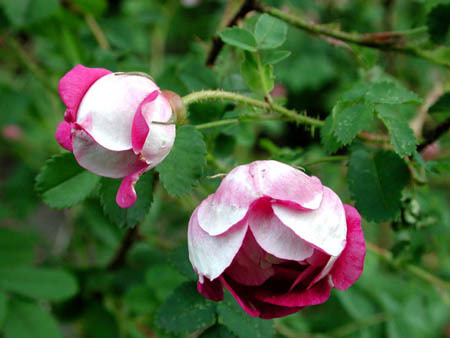 Scots Rose ‘Mary Queen of Scots’. Rose images © Peter Boyd, with permission. 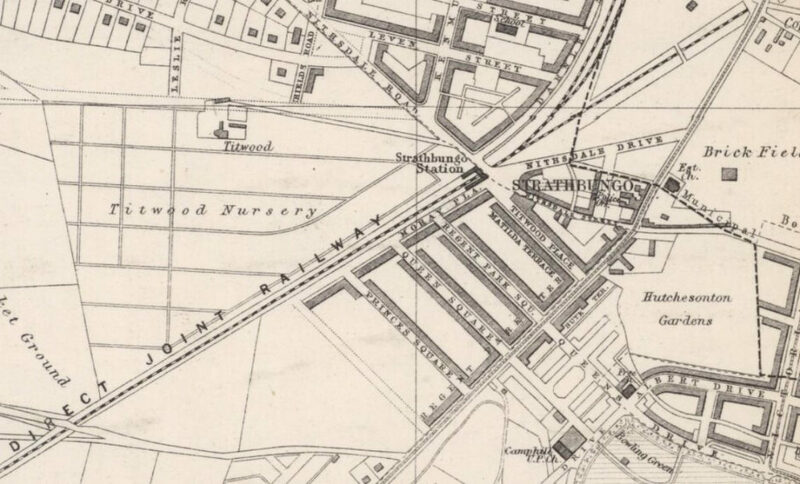 The railways began to encroach on the site, and the site to the west of Pollokshaws Road was split by the railway, with a footbridge across it. 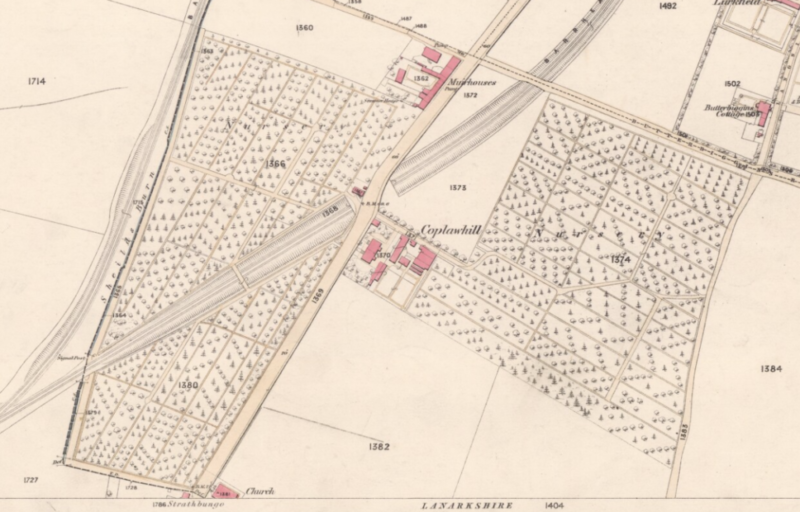 The nursery left Coplawhill in 1868, moving to Titwood on the Pollok Estate (the site is now Hutcheson’s Grammar School and Fotheringay Road), and then to their Cathcart nursery in 1886. The Titwood Nursery closed in 1889. The Coplawhill Tramworks was built on the larger northerly portion, initially with stables for horses, but later expanding over the entire site to become the hub of Glasgow’s electric tram network. The smaller site south of the railway became the Nursery Brickworks. It is now housing, but the former use lives on in the street name, Nursery Street. The Nursery, c 1858. Albert Road now runs between the Muirhouses (in pink) and the northern end of the nursery. The same site in 1894. 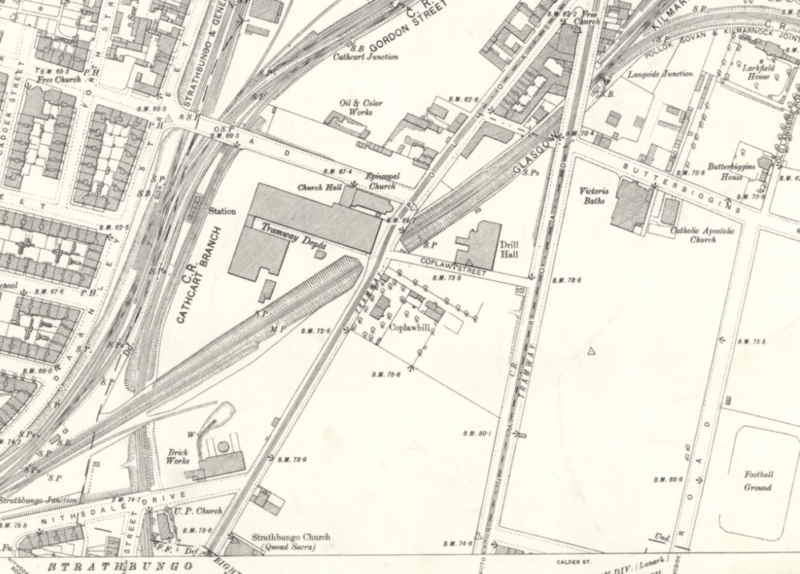 The tramworks, brickworks, Victoria Road, Albert Road, and several railway lines, are all new. The tramworks expanded to eventually cover the entire plot. After closure in 1964 they were converted to Glasgow’s Transport Museum until it moved to Kelvinhall in 1987. A much reduced building became Tramway, and the Hidden Gardens opened in the new space behind it in 2003. In 1888 the business was still in family hands in Hugh Austin, partnered since 1860 by James Hunter, who was succeeded by his son Alexander Neilston Hunter. A celebratory dinner was held in Glasgow in 1917 to mark the firm’s bicentennial. 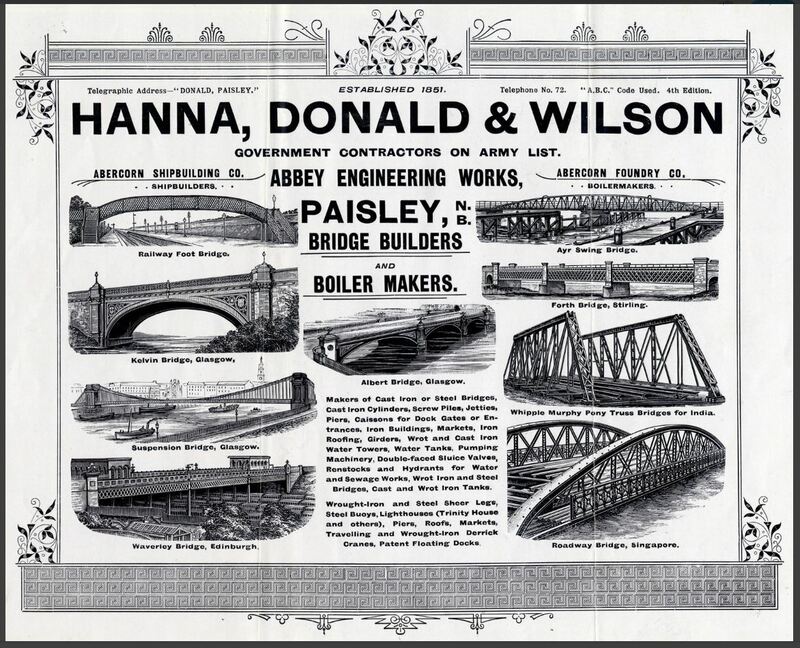 The company continued in business in Glasgow until the 1960s when it moved to Edinburgh, then disappeared. Until it left Glasgow it was considered the oldest continuously trading company in the city. The company records are in the Glasgow University Archives. With the redevelopment of the Tram Depot into Tramway and the Scottish Ballet building, it is fitting that the open space has returned to its original horticultural use, as the Hidden Gardens. Founded by NVA public arts organisation in 2003, The Hidden Gardens is an award-winning unique public green space and community development organisation located in one of Scotland’s most diverse communities. Find out more at their website, or visit (entrance through Tramway on Albert Drive). The only known photographs of it are the one above, courtesy John Robin, and this one. 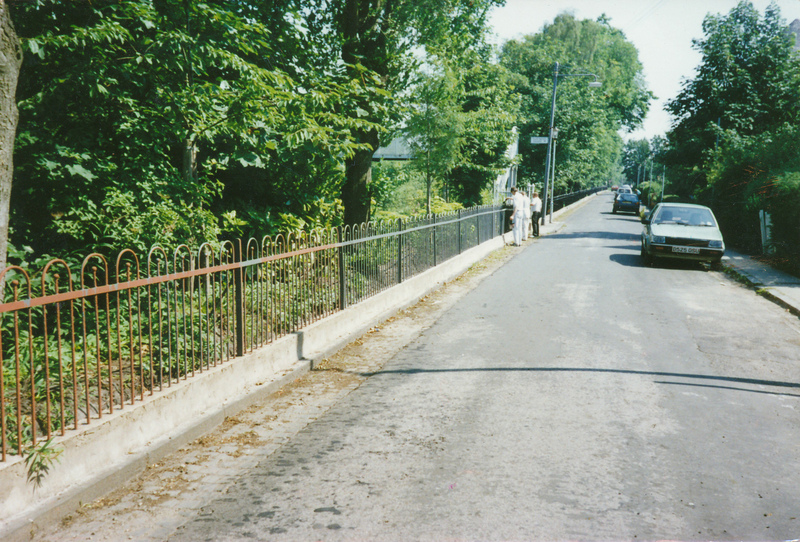 Railings after fence and concrete repair and painting, circa 1990. Courtesy John Devitt. 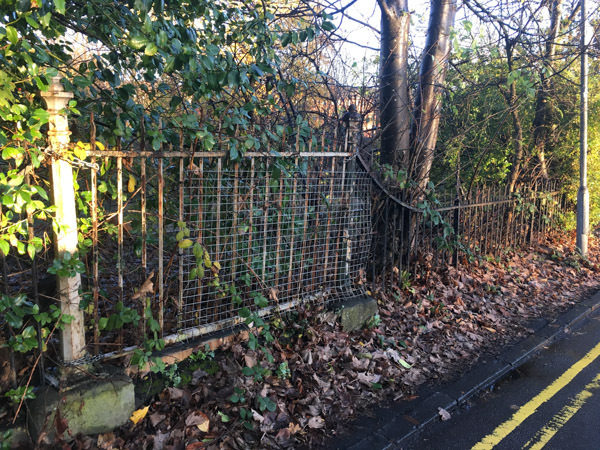 Below, in 2016 all that remained were the gate to the footbridge, and a short length of spiked railings, in the undergrowth at the end of Marywood Square. Some of this disappeared in 2017 when Network Rail replaced the fencing. The footings of the bridge can just about be seen the other side of the fence, as can the bricked up exit on Darnley Road. A love this part o’ Nithsdale Road, Glesca. Not the posh end wi’ a’ the big hooses and the high falutin’ folk, ye ken. Naw. A love this end, the Strathbungo end. The end wi ’the pubs. One pub on each corner o’ this part of the street frae number 2 tae number 88 on the south side and number 5 tae 85 on the other. It’s a’ closes and shops in between the pubs. 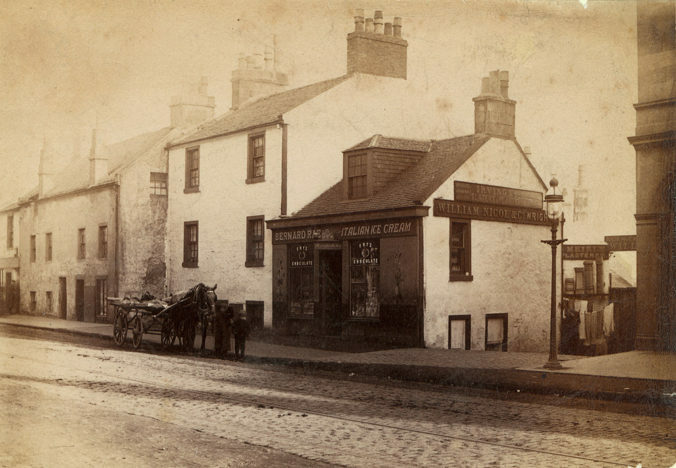 The Regency pub is at the corner o’ Polloksaws Road wi’ its busy tramlines. The Titwood Arms is at the other end near the railway station and opposite th Titwood is Sammy Dows…. Ye’re wonderin’ aboot the other corner – right opposite the Regency? A licensed grocer wi no mulk – jist booze. And tae prove it – its whole side wall is covered in a poster of a giant man stridin’ along. Johnny Walker of course! This evening am no’ stridin’ – am jist dawdling, no so steady on ma feet, along the stone pavement. Av had a few wi’ ma pals at the Regency so am off along the road tae the Titwood fur a few mare. It’s a Friday after a’ and uv got the envelope with ma pay in ma pocket… The wife’ll no’ see much o’ that, wull she? Am keepin’ tae the sunny side o’ the street. A heard that the lang building on this side was built by a famous man – architect Thomson somethin’. Something tae dae wi the Greeks. Righ’ enough – and am lookin’ up at the tap floor, two flights up, the stones are nice and big and grey – jist like in Bath Street in the West End . Am lookin’ across the road noo – across the cobbles tae the barber’s wi’ his fancy pole – the buldin’ oan the other side looks kinda dark – not like this side – must be the soot frae Dixon’s Blazes where ma pal Jock works. Hard job that – shovelin’ coal intae the furnace a’ day. Past the shopes- sweeties, chemists, the dairy…. They cun keep their mulk. Och, a need somethin’ tae hang on tae. Tae steady me up. A tree? There’s nae trees in the street – no’ here in Glesca – they’re a’ in the back greens wi’ the middens – so ave got tae hang on tae a lamp post. It’ll no’ be till near eleven till the lamplighter gets here the night… Summer…..! On ma way again. Watch oot you weans! – al try an’ keep oot of yer way. This pavement’s good for the peever and the skipping, intit? A see ye were at school the day – that wee lassie’s still got oan her uniform – brown jailet and skirt – so she’s a Catholic – not a proddy like me. Whit are they callin’ her? Senga? Senga? Aye, a think that’s Agnes backwards. And that lassie holdin’ the rope – she’s one of they Jews – something aboot her face. Quite a lot o’ Jews round here – must of moved away frae the Gorbals. The Catholics say they Jews killed Christ but whit dae I care – it’s the Catholics that won the elections in the City Chambers am worried aboot. Coal! Coal! – aye, there’s the coal cart coming up the road rumbling over the cobbles! They Clydesdale horses are still doin’ a grand job! And the coalmen – two flights up with the black stuff on their backs…. Am glad am no working a’ that. A see now cards with numbers stuck on some o’ the big windies up above me–That means they’ve got two bags – hundredweights – to take up the next close. Better them than me…. Oop..
And whit’s that – a nearly fell over these wains – two o’ them – kneeling doon in ma way on the kerb at the stank. Och a remember doin’ that in the Gallowgate – puttin’ chewing gum on a string tryin’ to hook a penny that’s rolled doon into the drain. They must be hopin’ fur two ha’penny gobstoppers from the sweetie shop. Passin’ the electric shop, another close, and then – whit a fancy front! Two shops jined together! “The Leisure Library” it says on the sign. Mibbe a should go in an’ pit ma feet up. A like tae go tae the pictures and read the papers – but a dinna read fur ma leisure – jist a few drinks and a night at the dogs. Saturday – ma leisure is the terraces at Hampden Park watching Rangers. Ma wife bought me a ticket for the stand fur ma birthday – it’s no fur me that wi’ a’ the toffs…. Next year a want a sail doon the wa’er for ma birthday…. A’ the way doon tae Rothesday and sozzled a’ the way hame. A neighbour in Jerusalem, Ephraim, turned out to have arrived in Scotland on the kindertransport and lived in Darnley Road. Before that there was a very posh fruit shop – Kate Young’s. The folks from the Pollokshields end of Nithsdale Road used to send their chauffeurs to Kate Young’s to pick up their orders. And there was an occasional pony and cart..